Virtualiron allows small organizations to focus on their core business, not on managing Information Technology (IT). It helps businesses become more productive, deliver easy access to applications from anywhere on any device, protect critical data, and provide an easy path to cloud integration. 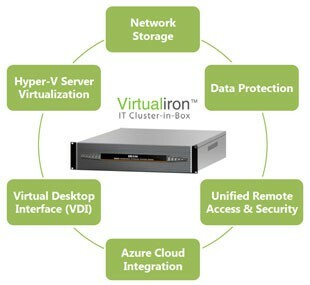 IRON Virtualiron family of next-generation intelligent appliances, powered by Windows Hyper-V clustering, Hyper-V network virtualization, Windows Server 2012 R2 and Windows Storage Server 2012 R2 technologies deliver on the promise to simplify, unify and improve business efficiencies. Its offers unique industry-leading, enterprise grade cluster-in-box hardware design which includes redundant hot-swap hardware configurations for motherboards, disks, fans and disks. It is a highly scalable, single device that can run 10s of VMs and provide storage scalability in the excess of 100TB; multiple devices can be combined to offer an enterprise grade scale-out infrastructure solution. It offers an affordable all-inclusive highly scalable infrastructure solution that can be used as a primary storage, server virtualization, VDI, and both a local and remote network access security device. It helps control access to applications easily; users can access their application and information from almost anywhere using virtually any device. It runs business critical applications and databases; easily protect, centralize, organize, and reduces the risk of data being stored or potentially lost on unprotected devices. IRON Virtualiron is custom designed for easy deployment, helps runs business applications on-premises and can be managed by individuals centrally with limited in-house IT services. It provides seamless integration to a growing number of cloud-based applications and services such as Windows Azure Backups, for an additional layer of data protection and Office 365 for email and collaboration services. Redundant design offers hot swap disks, motherboards, fans and PS; uses software RAID, virtually no single point of hardware failures. Microsoft Windows Server 2012 R2 running on Virtualiron hardware appliance platform provides small-mid size businesses and branch offices with everything for managing an entire IT infrastructure in one box. It provides greater flexibility for customers to choose on premises or cloud-based solutions, migrate from one to the other, or provide a hybrid solution using simple administration which does not requiring a large IT department. "Two, Windows Server Datacenter Edition (included) Unlimited VM support license "